“Today is my birthday, and I am so excited. / One piñata filled with candy. / Two hours until the party. / Three tables set for all of the guests.” Mateo counts to twelve as he anticipates the fun he’ll have at his party! There will be family, friends and lots of goodies for the children: tops, marbles and even toy cars! But before the children can hit the piñata, they will sing the birthday boy a song and enjoy eating a delicious cake. And then Mateo will be “the happiest boy in the whole wide world,” because he gets to swing at the piñata first with everyone cheering him on: ¡Dale! ¡Dale! ¡Dale! Acclaimed kids’ book author René Saldaña, Jr. creates another winner with his first picture book, illustrated in vibrant colors by Carolyn Dee Flores, for children ages 4-8. In this birthday-themed counting book, children will relish practicing their counting skills while dreaming about hitting a piñata at their very own fun-filled fiesta. 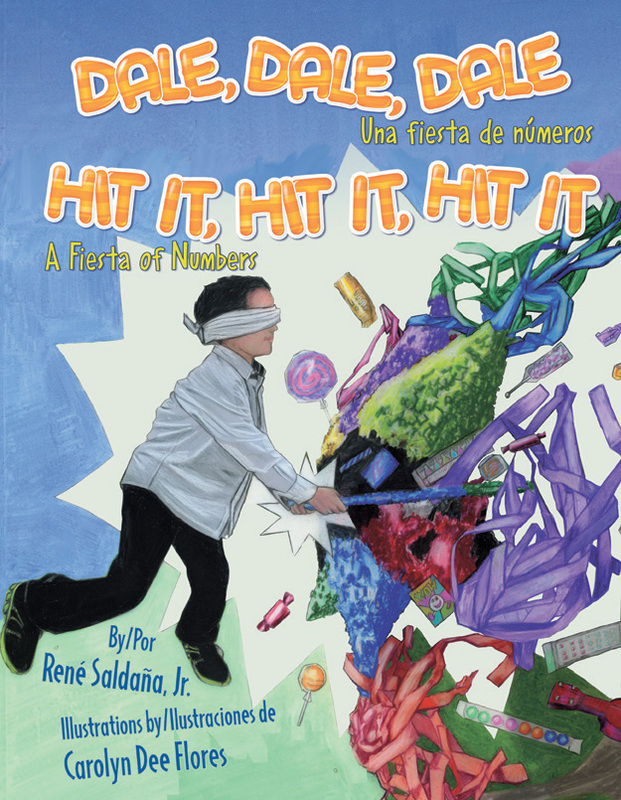 Click here to listen to an interview with Carolyn Dee Flores, illustrator of Dale, dale, dale: Una fiesta de números / Hit It, Hit It, Hit It: A Fiesta of Numbers. RENÉ SALDAÑA, JR. is the author of several acclaimed novels for young people that depict life in Mexican-American communities. Reviewers have used words like “powerful,” “provocative,” “engaging,” and “accessible” to describe his work. In A Good Long Way, an affecting novel that follows the troubled lives of three teens in deep South Texas, Saldaña once again writes a fast-paced narrative that will engage young adults in questions about their own lives and responsibilities to family, friends, and most of all, to themselves. He is the author of a bilingual story collection, Dancing with the Devil and Other Tales from Beyond / Bailando con el Diablo y otros cuentos del más allá (Piñata Books, 2012), which features supernatural elements rooted in Latino folklore. His other books include The Whole Sky Full of Stars (Random House, 2007), Finding Our Way: Stories (2003) and The Jumping Tree (Delacorte, 2001). He lives in Lubbock, Texas, where he teaches in the College of Education at Texas Tech University. CAROLYN DEE FLORES is the illustrator of Canta, rana, canta / Sing, Froggie, Sing (Piñata Books, 2013). A graduate of Trinity University, she is a member of the Society of Children’s Book Writers and Illustrators. She lives and works in San Antonio, Texas.